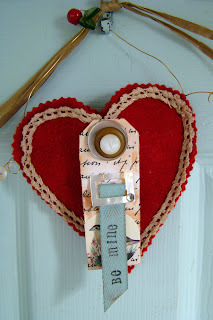 Please pop on over to the Small Town Living blog to see the little Valentine tutorial I created for my friend, Tina. I'd do anything for that gal! Your heart design is very pretty and I'm going to hop on over and check out the tutorial. Oh, that is super cute! I love the little buckle with the ribbon -- how pretty!